Print: 9 x 6 x 3/16th inches, Author: 5 inches tall, With Display Base: 9 1/4 x 6 1/2 x 2 inches. 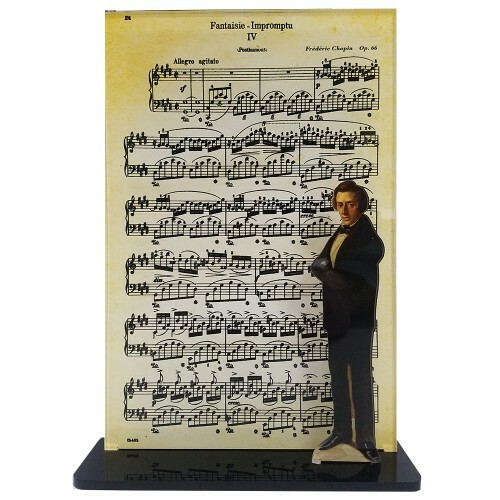 Our clear acrylic display of Frederic Chopin and their work: Fantaisie Impromptu IV. All acrylic displays come in three pieces: a mini clear acrylic standee of the artist, an opaque black acrylic base, and artwork printed on 3/16th clear acrylic. Items are printed and produced to order. Printing and processing takes up to 5 business plus shipping time to your location. Masters and Their Works are NOT printed on glass but gives the illusion of glass.A Polish composer and virtuoso pianist of the Romantic era who wrote primarily for solo piano. He has maintained worldwide renown as a leading musician of his era, one whose "poetic genius was based on a professional technique that was without equal in his generation.